We have to deal with a huge amount of data so we need a rock solid architecture. While keeping a bulletproof security level. On the left, we have our sensors. Let’s assume they can push data every second over TCP using a POST and let’s suppose we have a million of them. We need an architecture capable to handle a million queries per seconds and able to resist any kind of network or hardware failure. TCP queries need to be distributed evenly to the application servers using load balancers and finally, the application servers are able to push the data to our multiple Mongos routers from our MongoDB Sharded Cluster. This kind of architecture is expensive and maintenance cost can be quite high as well. Now let’s solve this same problem with MongoDB Stitch! Because MongoDB Stitch is capable of scaling automatically according to demand, you no longer have to take care of infrastructure or handling failovers. 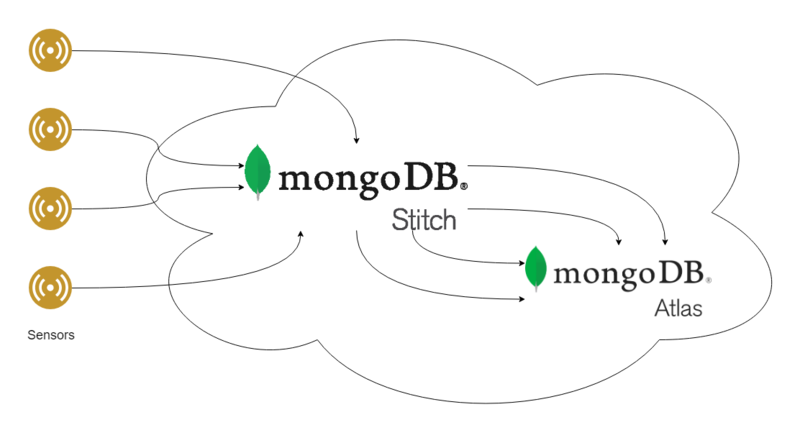 You can also try MongoDB Stitch for free and discover how the billing works.